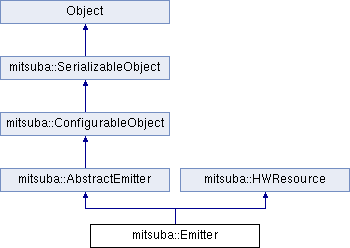 This class provides an abstract interface to all emitter plugins in Mitsuba. It exposes functions for evaluating and sampling the emission profile, and it allows querying the probability density of the sampling method. This list of flags is used to additionally characterize and classify the response functions of different types of sensors. Is this an environment emitter, such as a HDRI map? Construct a new emitter instance. Unserialize a emitter instance from a binary data stream. Return the radiant emittance for the given surface intersection. This is function is used when an area light source has been hit by a ray in a path tracing-style integrator, and it subsequently needs to be queried for the emitted radiance along the negative ray direction. It efficiently computes the product of evalPosition() and evalDirection() divided by the absolute cosine of the angle between d and its.shFrame.n. This function is provided here as a fast convenience function for unidirectional rendering techniques. The default implementation throws an exception, which states that the method is not implemented. Return the radiant emittance from an environment emitter. This is function is called by unidirectional rendering techniques (e.g. a path tracer) when no scene object has been intersected, and the scene has been determined to contain an environment emitter. The default implementation throws an exception. Fill out a data record that can be used to query the direct illumination sampling density of an environment emitter. This is function is mainly called by unidirectional rendering techniques (e.g. a path tracer) when no scene object has been intersected, and the (hypothetical) sampling density of the environment emitter needs to be known by a multiple importance sampling technique. Return a bitmap representation of the emitter. Some types of light sources (projection lights, environment maps) are closely tied to an underlying bitmap data structure. This function can be used to return this information for various purposes. Return a sub-element of a compound emitter. When expanding emitters, the scene will repeatedly call this function with increasing indices. Returning NULL indicates that no more are available. Return the luminaire's sampling weight. This is used by the luminaire importance sampling routines in Scene. Is this a compound emitter consisting of several sub-objects? Importance sample a ray according to the emission profile. This function combines both steps of choosing a ray origin and direction value. It does not return any auxiliary sampling information and is mainly meant to be used by unidirectional rendering techniques. Note that this function potentially uses a different sampling strategy compared to the sequence of running sampleArea() and sampleDirection(). The reason for this is that it may be possible to switch to a better technique when sampling both position and direction at the same time. An importance weight associated with the sampled ray. This accounts for the difference between the emission profile and the sampling density function. Serialize this emitter to a binary data stream.